Surveillance Photos Released of Wanted Suspect. APD needs your help identifying the man in these surveillance photos. He shot at a gas station clerk and fought with the attendant after his gas card wasn't working. 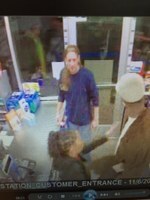 The incident happened on Sunday, November 6th around 8 p.m. at the Wal-Mart gas station on Unser. Witnesses say the man started yelling at the clerk and when the clerk asked him to leave, they got into a physical fight. The suspect then waited for the clerk to get off work and fired a single shot through the clerk's back windshield as he left fro the night. No one was injured. There was also an unidentified female with the suspect the night of the shooting. If you have any information, please call (505) 242-COPS.